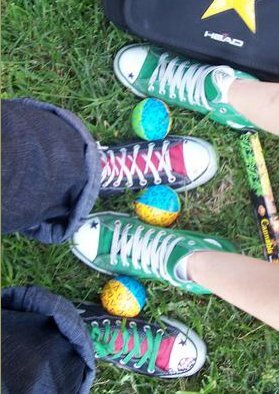 The main green color of chucks with matching green racing stripe. 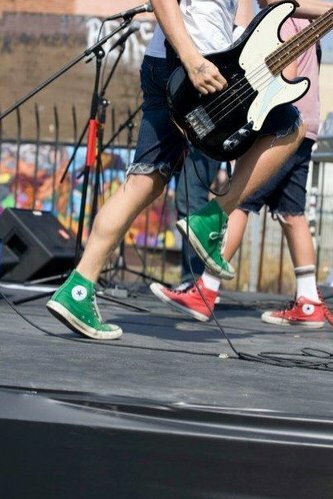 1 Celtic Green HIgh Top Chucks Bass player wearing Celtic green high top chucks. 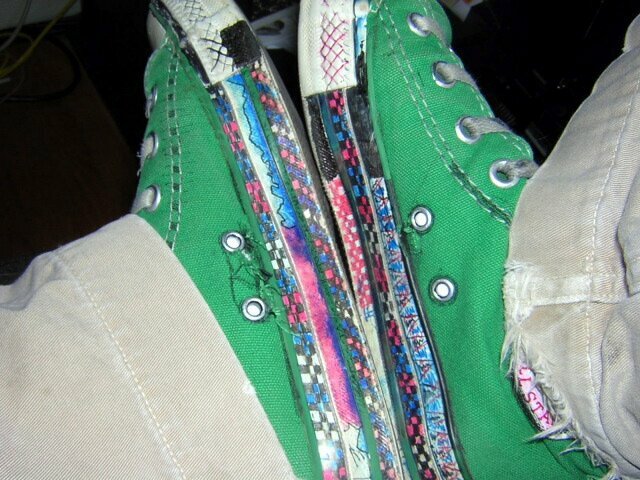 2 Celtic Green HIgh Top Chucks Celtic green high top, angled right inside patch view. 3 Celtic Green HIgh Top Chucks Celtic green high top, left inside patch view. 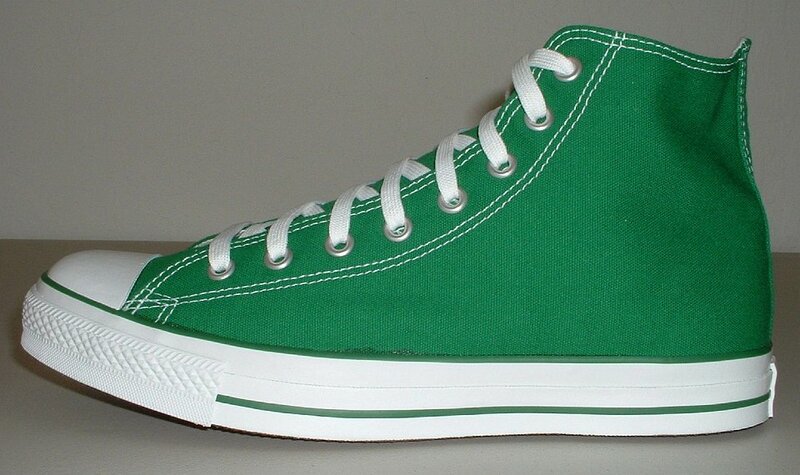 4 Celtic Green HIgh Top Chucks Celtic green high top, right inside patch view. 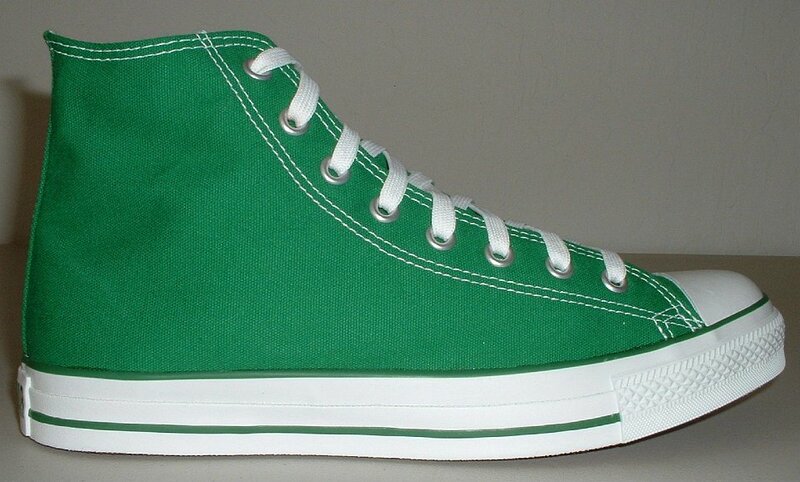 5 Celtic Green HIgh Top Chucks Celtic green high top, right outside view. 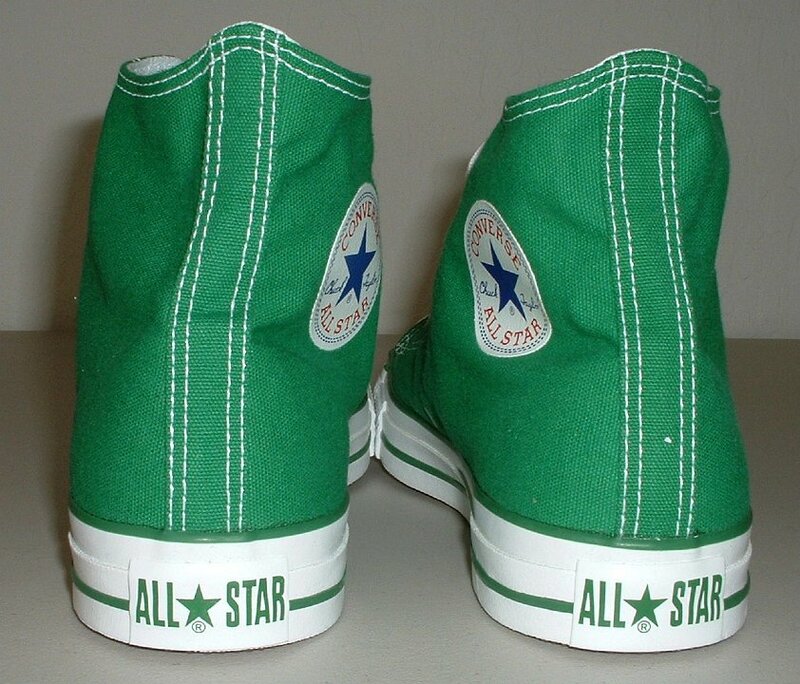 6 Celtic Green HIgh Top Chucks Celtic green high top, left inside patch view. 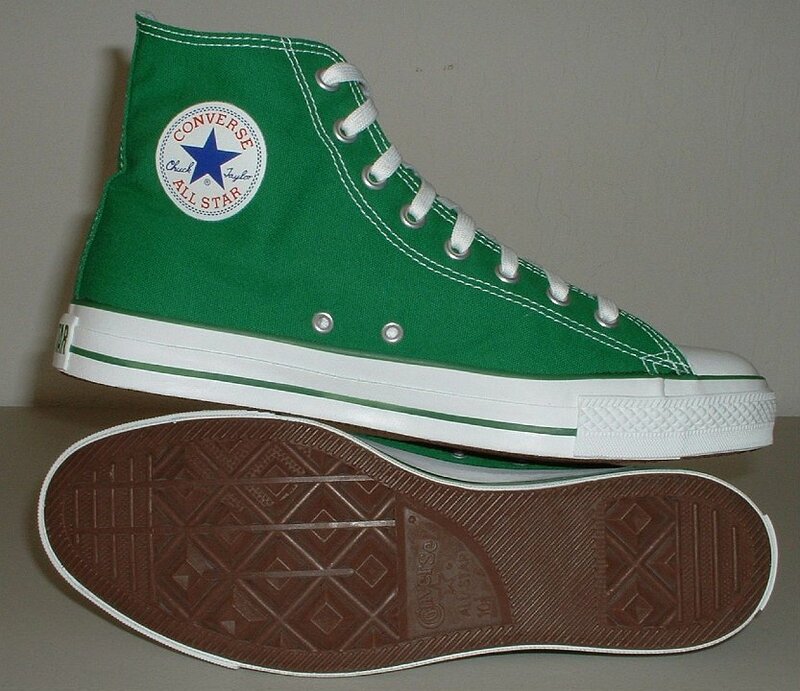 7 Celtic Green HIgh Top Chucks Celtic green high top, left outside view. 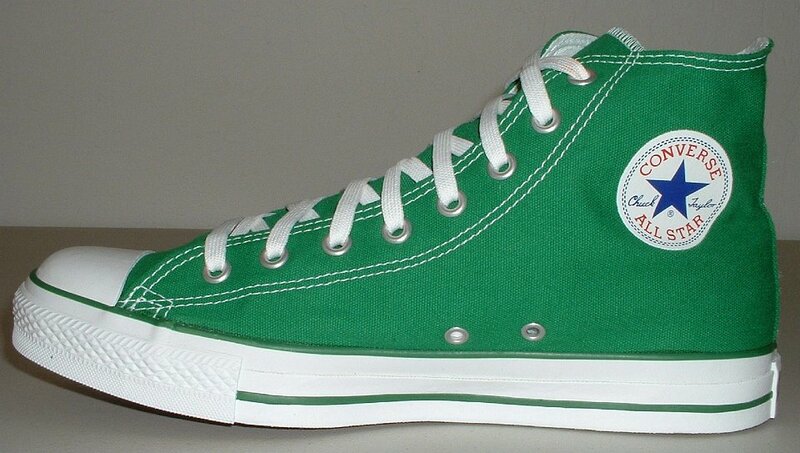 8 Celtic Green HIgh Top Chucks Front view of celtic green high top chucks. 9 Celtic Green HIgh Top Chucks Angled front view of celtic green high top chucks. 10 Celtic Green HIgh Top Chucks Rear view of celtic green high top chucks. 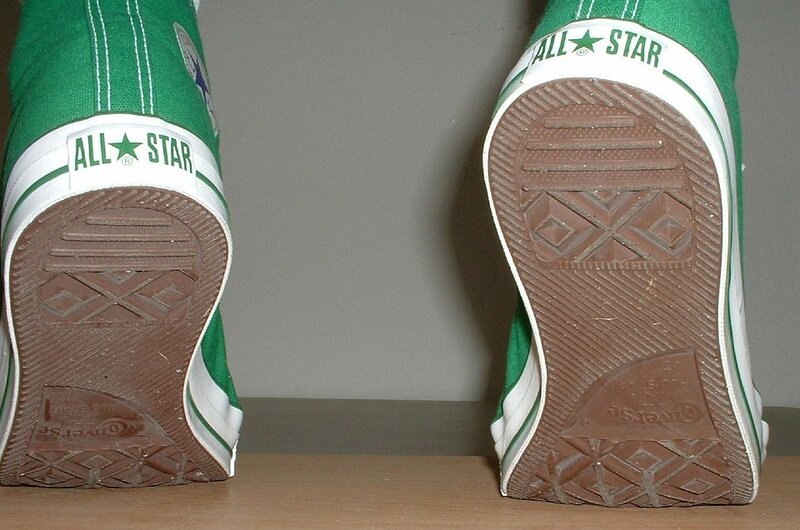 11 Celtic Green HIgh Top Chucks Inside patch and sole views of celtic green high top chucks. 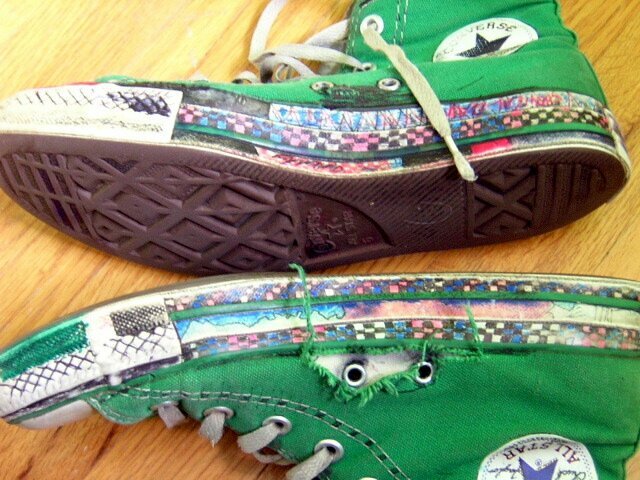 12 Celtic Green HIgh Top Chucks Inside patch views of celtic green high top chucks. 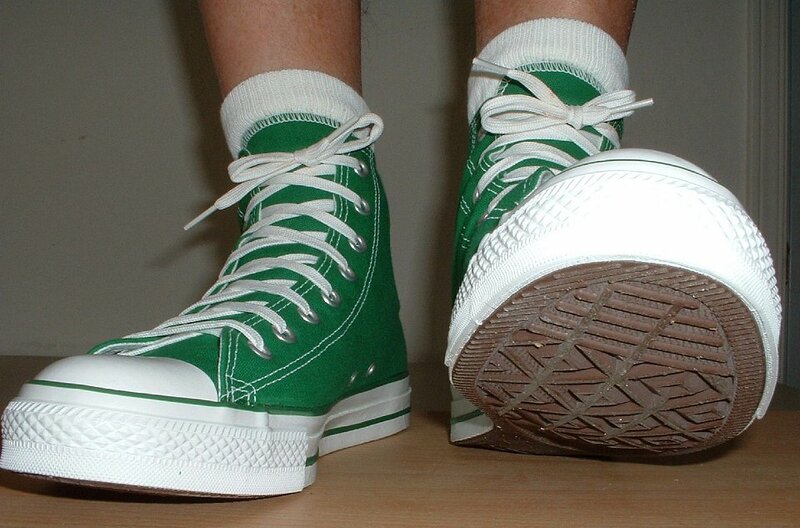 13 Celtic Green HIgh Top Chucks Top view of celtic green high top chucks. 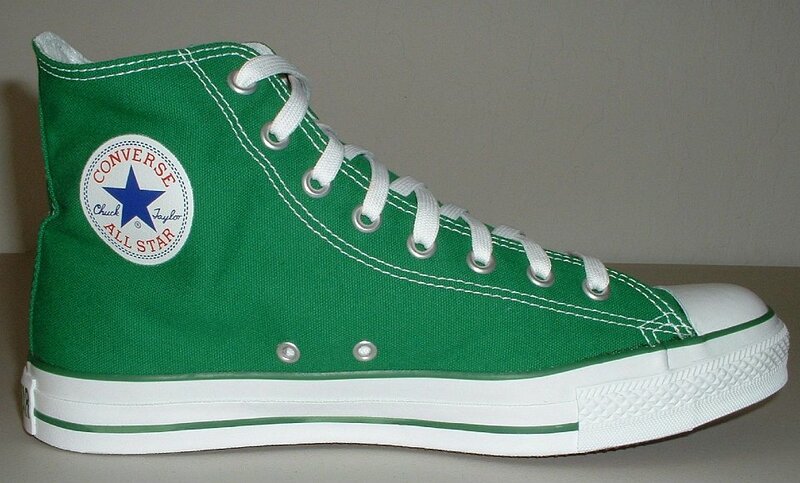 14 Celtic Green HIgh Top Chucks Wearing celtic green high top chucks, front view 1. 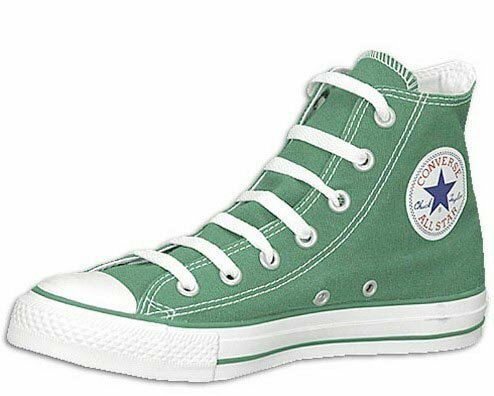 15 Celtic Green HIgh Top Chucks Wearing celtic green high top chucks, front view 2. 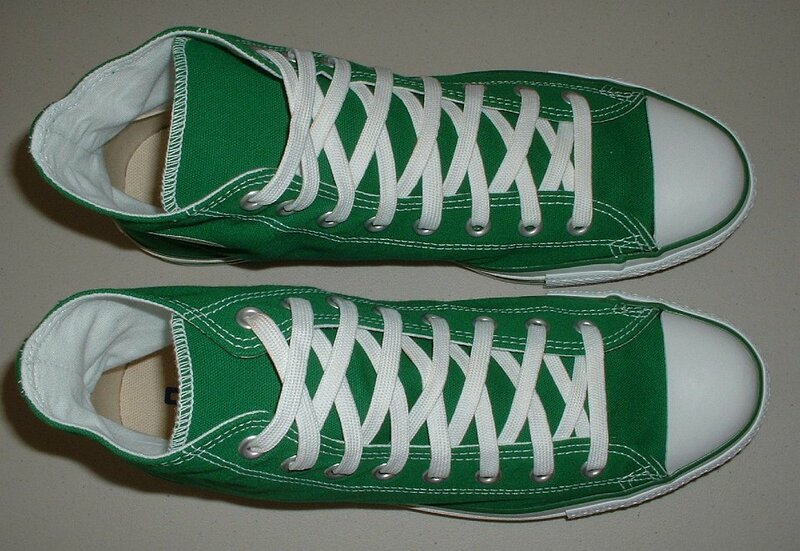 16 Celtic Green HIgh Top Chucks Wearing celtic green high top chucks, left view. 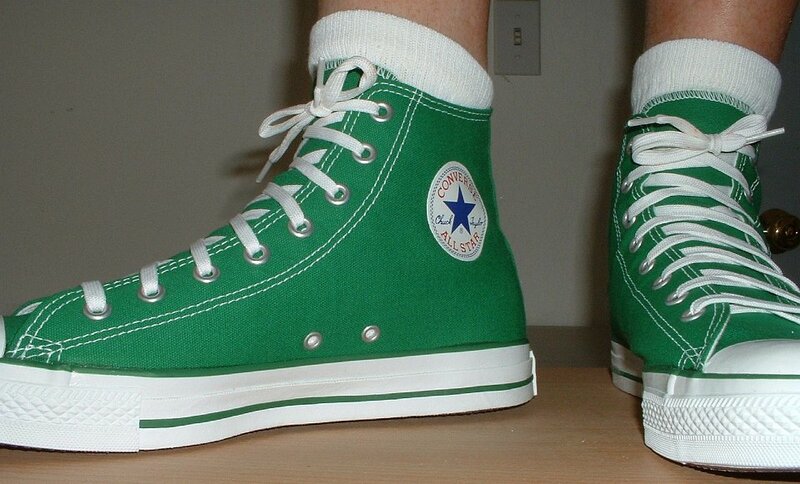 17 Celtic Green HIgh Top Chucks Wearing celtic green high top chucks, rear view 1. 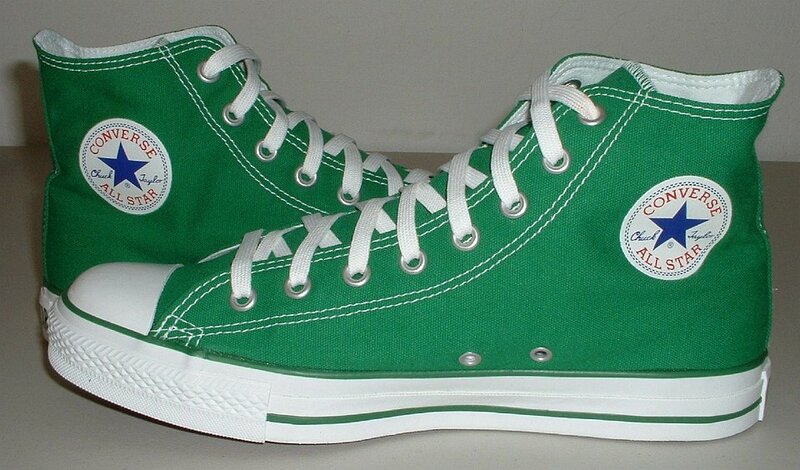 18 Celtic Green HIgh Top Chucks Wearing celtic green high top chucks, front view 3. 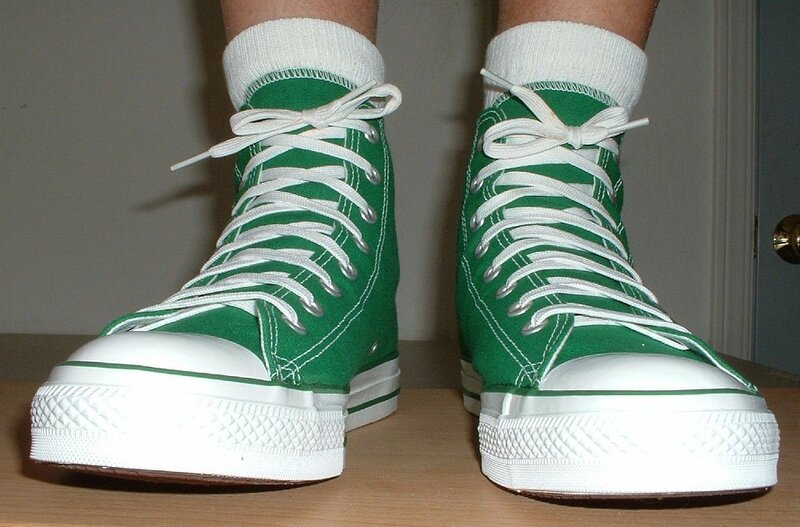 19 Celtic Green HIgh Top Chucks Wearing celtic green high top chucks, rear view 2. 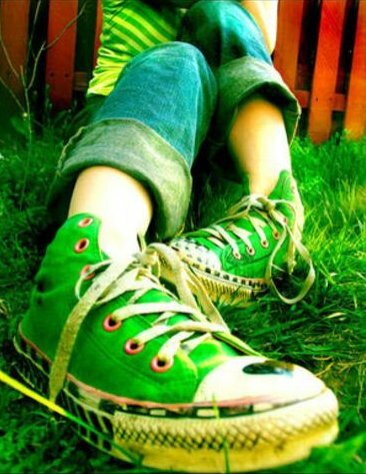 20 Celtic Green HIgh Top Chucks Wearing celtic green high top chucks with red shoelaces. 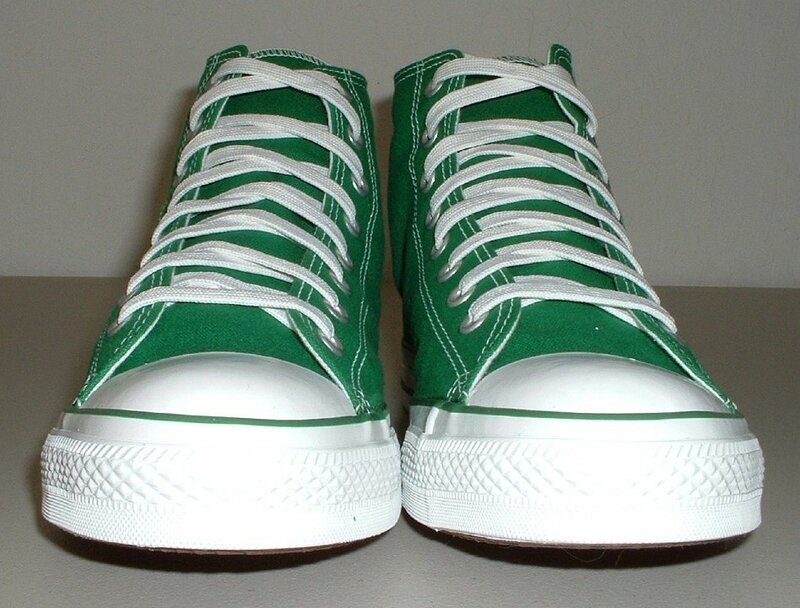 21 Celtic Green HIgh Top Chucks Wearing celtic green high top chucks, right side view 1. 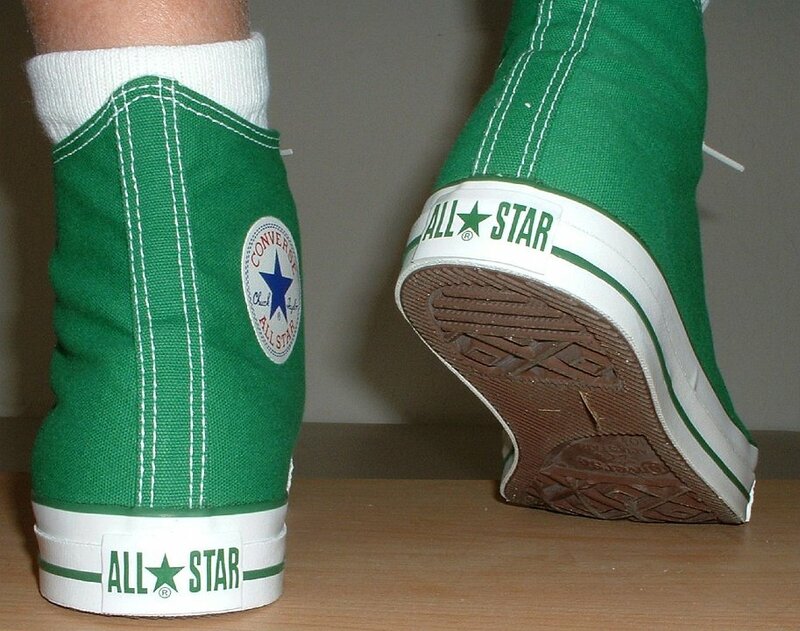 22 Celtic Green HIgh Top Chucks Wearing celtic green high top chucks, top view. 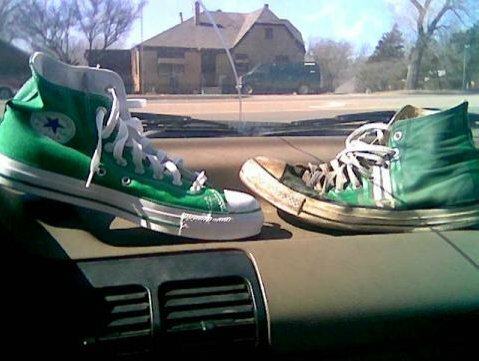 23 Celtic Green HIgh Top Chucks Celtic green high tops on a car dashboard. 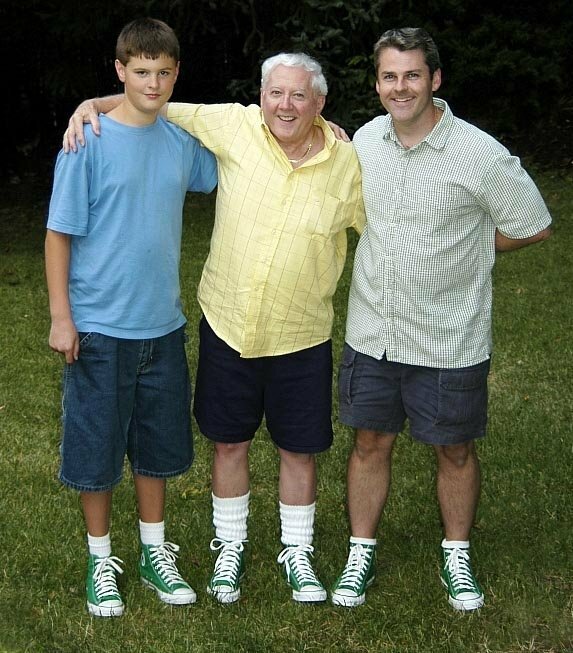 24 Celtic Green HIgh Top Chucks Three generations wearing green high tops. 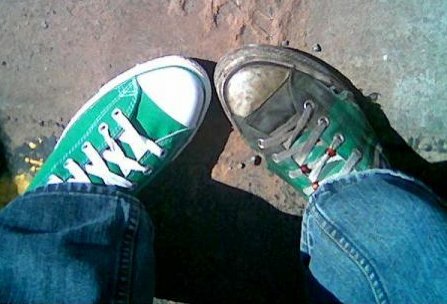 25 Celtic Green HIgh Top Chucks Old vs. new green chucks, shot 1. 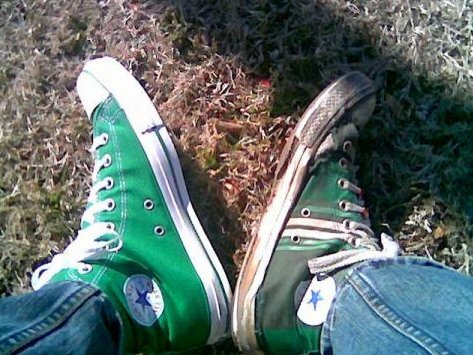 26 Celtic Green HIgh Top Chucks Old vs. new green chucks, shot 2. 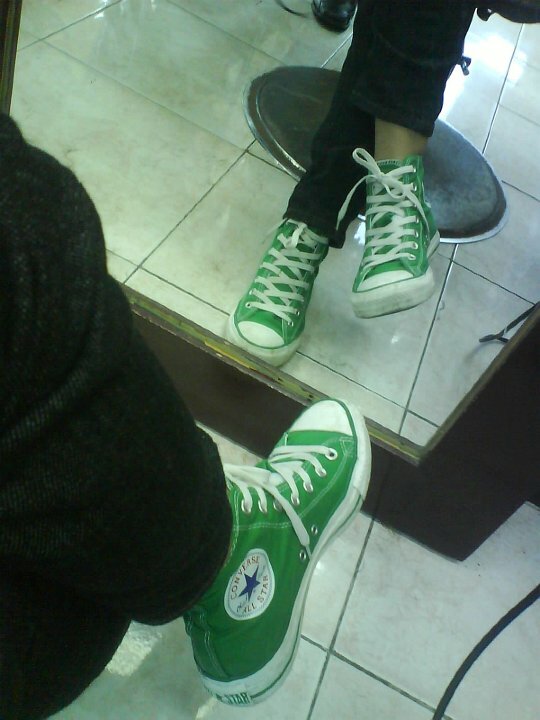 27 Celtic Green HIgh Top Chucks Wearing cletic green high top chucks. 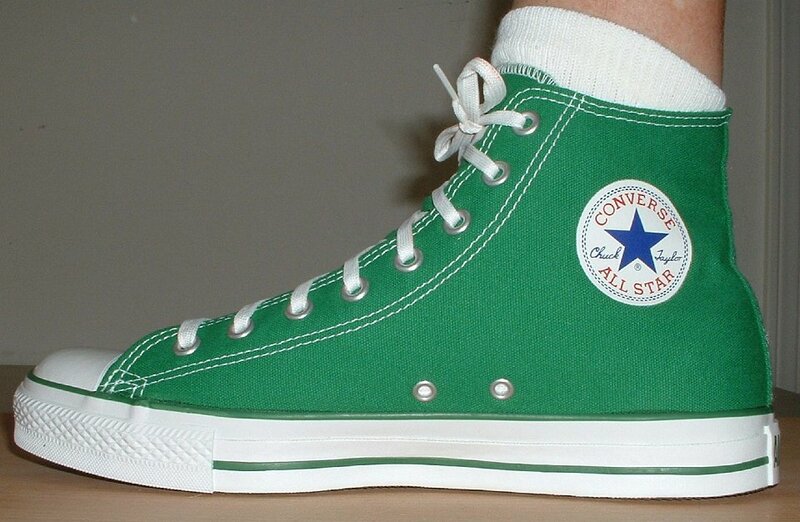 28 Celtic Green HIgh Top Chucks Wearing drawn on green high top chucks. 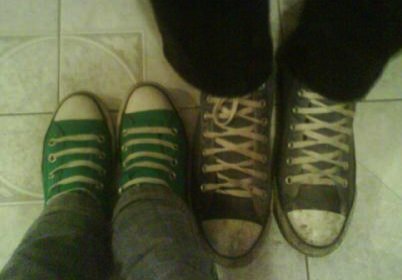 29 Celtic Green HIgh Top Chucks Wearing pine green chucks with two different laces. 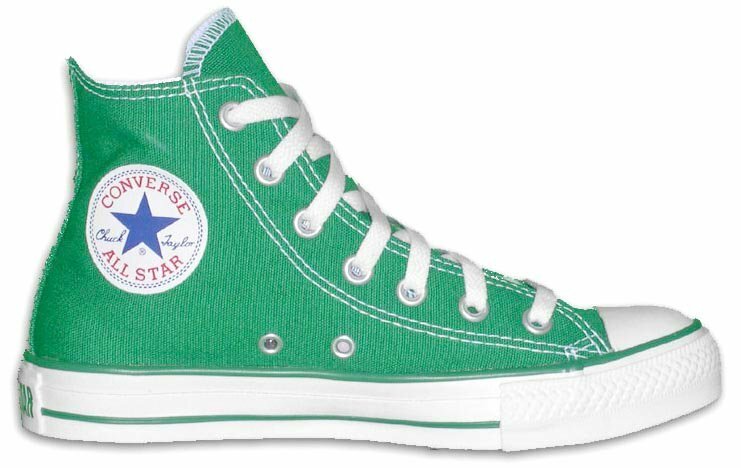 30 Celtic Green HIgh Top Chucks Wearing green high top chucks. 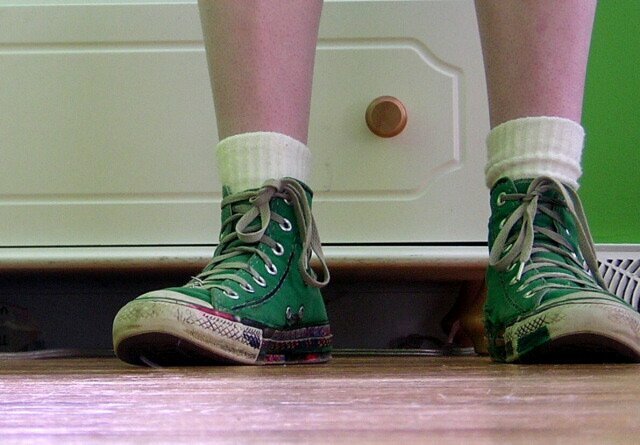 31 Celtic Green HIgh Top Chucks Top view of worn celtic green high tops. 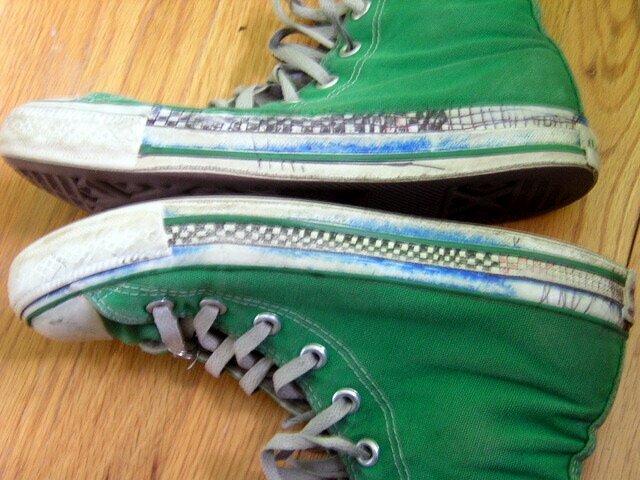 32 Celtic Green HIgh Top Chucks Well worn Celtic green high top with artwork, shot 1. 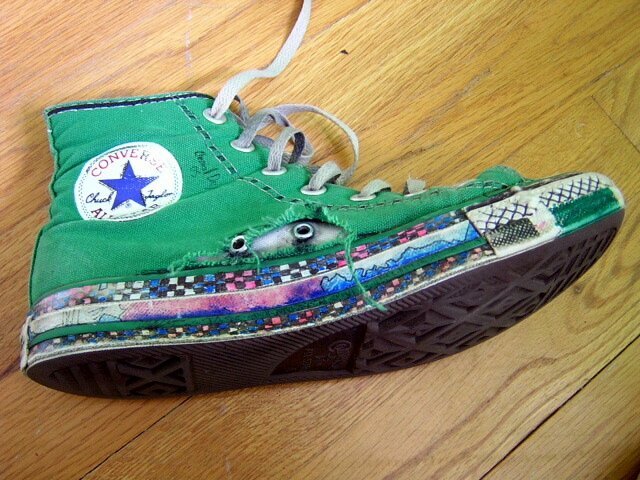 33 Celtic Green HIgh Top Chucks Well worn Celtic green high top with artwork, shot 2. 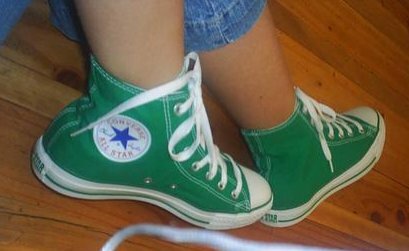 34 Celtic Green HIgh Top Chucks Well worn Celtic green high top with artwork, shot 3. 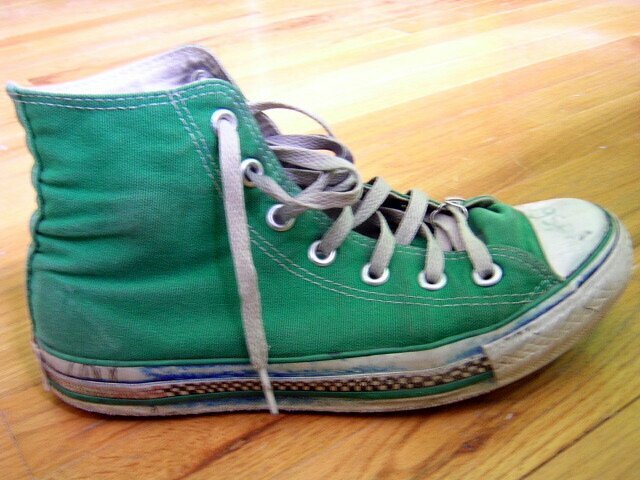 35 Celtic Green HIgh Top Chucks Well worn Celtic green high top with artwork, shot 4. 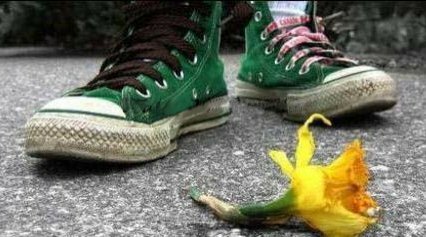 36 Celtic Green HIgh Top Chucks Well worn Celtic green high top with artwork, shot 5. 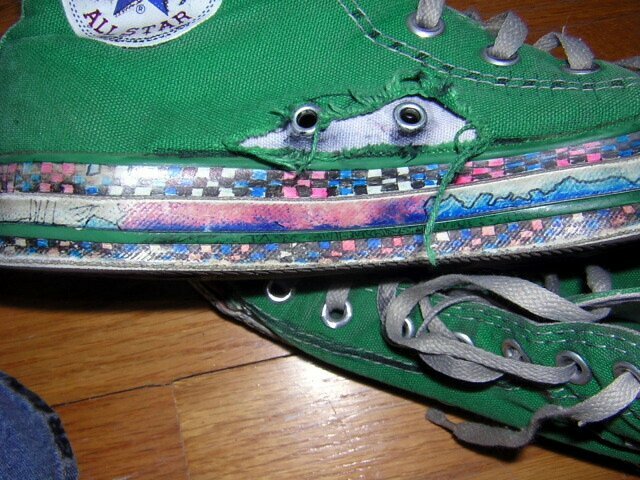 37 Celtic Green HIgh Top Chucks Wearing well worn Celtic green high tops with artwork. 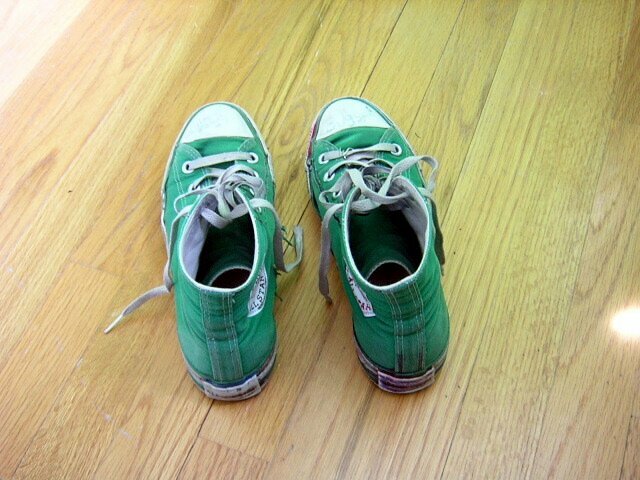 38 Celtic Green HIgh Top Chucks Wearing well worn Celtic green high tops with artwork, shot 2.